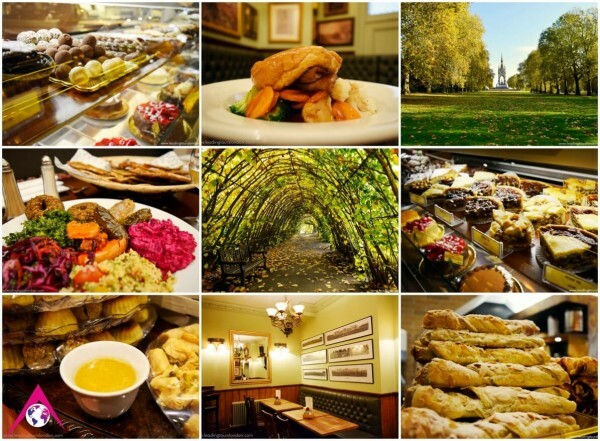 A delicious tour of London, tasting international food and traditional specialties! We promise you an unforgettable Food Tour of London in an exceptionally wonderful atmosphere, enjoying the flavours of the world. Eat delicious British Hampshire Roast Beef with Yorkshire pudding for lunch. 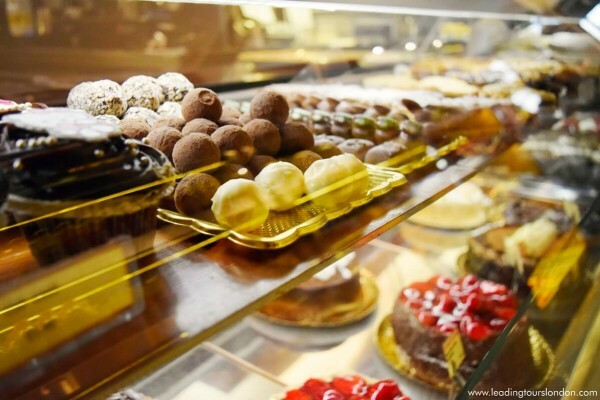 Taste divine chocolates from all over the world in a renowned London shop for exotic sweets and delights. 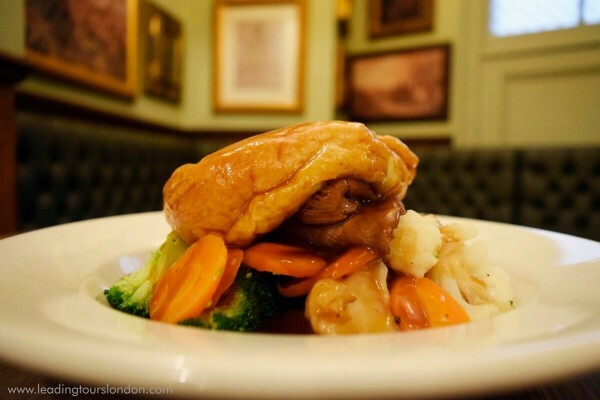 The Food Tour starts visiting a traditional British pub in Mayfair, situated right at the heart of London’s West End. You will enjoy wonderfully cooked British Hampshire Roast Beef, served with roast potatoes, seasonal vegetables, gravy & Yorkshire pudding. The Roast Beef is a popular Sunday meal in Britain. 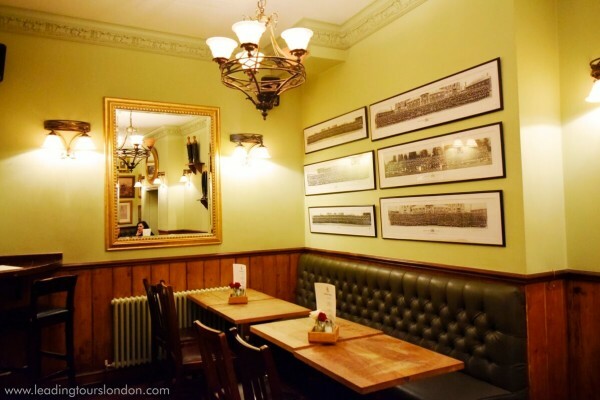 Immersed in the splendid atmosphere of the pub, you will learn interesting facts about the traditional British cuisine. 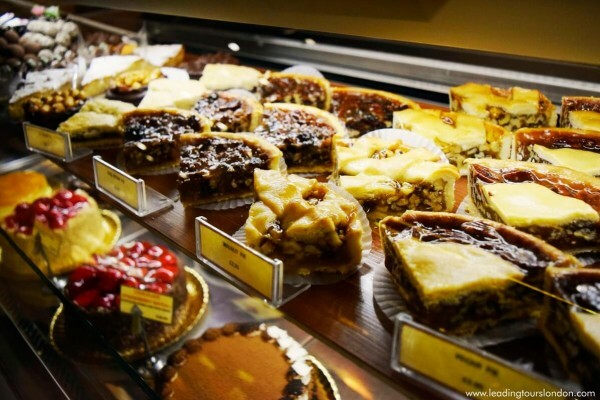 Then, the food tour proceeds through fabulous small streets, leading you to an amazing Patisserie. 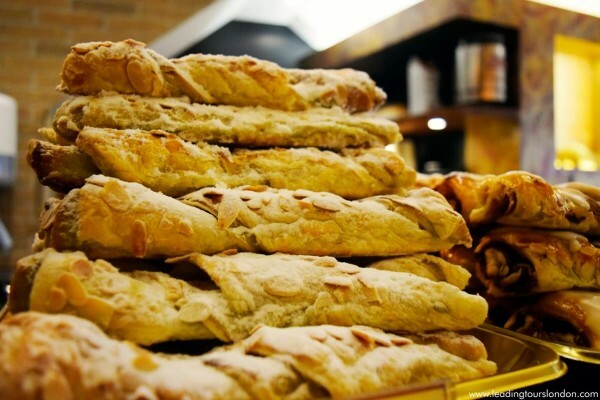 In this particular Patisserie, located at the heart of Marylebone, you will have the pleasure to taste some of the greatest selection of traditional and international pies and pastries, that Londoners adore. 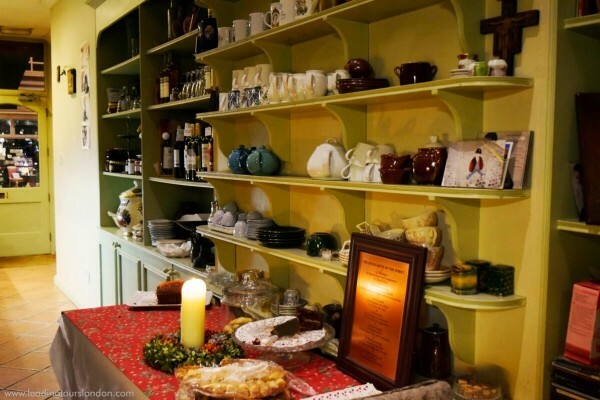 Don’t not miss the chance to try the freshly made apple pie and the delicious pecan pie. Then you will enjoy a brisk guided walking tour of the nearby area, including visiting a charming place for a cup of traditional British Tea. 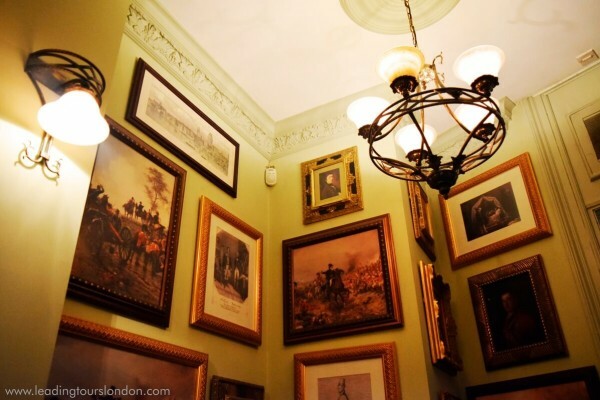 During the walking tour you will have time for shopping and exploring Marylebone. 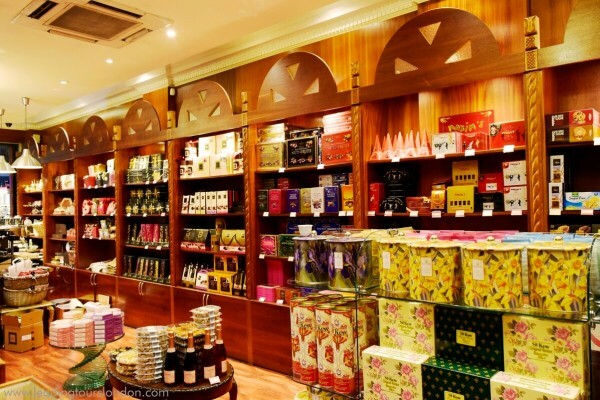 Once you have tasted the brilliant aroma of British Tea, you will proceed to Edgware Road, where you will visit a fascinating shop that sells chocolate delights from all over the world. 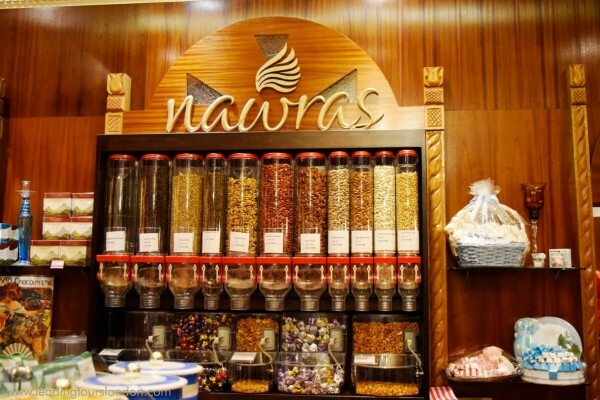 Dip yourself into the world of wonders by enjoying an amazing selection of gorgeous English sweets, divine Belgian chocolates, an elegant range of biscuits, coffees and exotic Arabic delights. An ideal moment to buy a sweet surprise for your loved once! 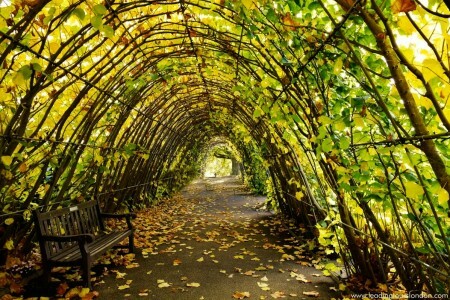 After this heart melting experience, your tour will continue to the south part of Kensington Garden, enjoying a guided tour on a double decker bus. 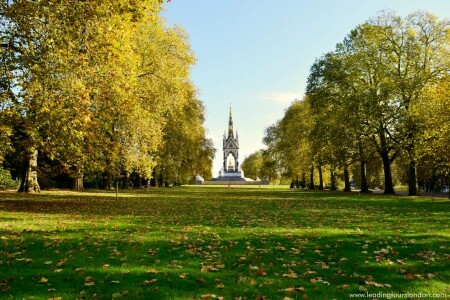 You stop by the famous Albert Memorial, commissioned by Queen Victoria in memory of her beloved husband, Prince Albert. 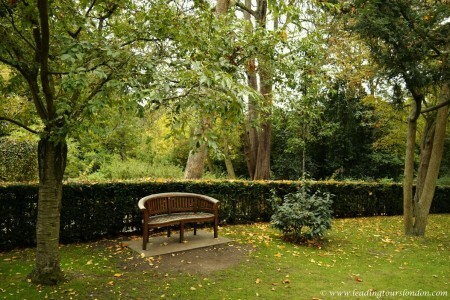 A guided tour of the area awaits you, revealing the beauties of Kensington area and its hidden secrets. 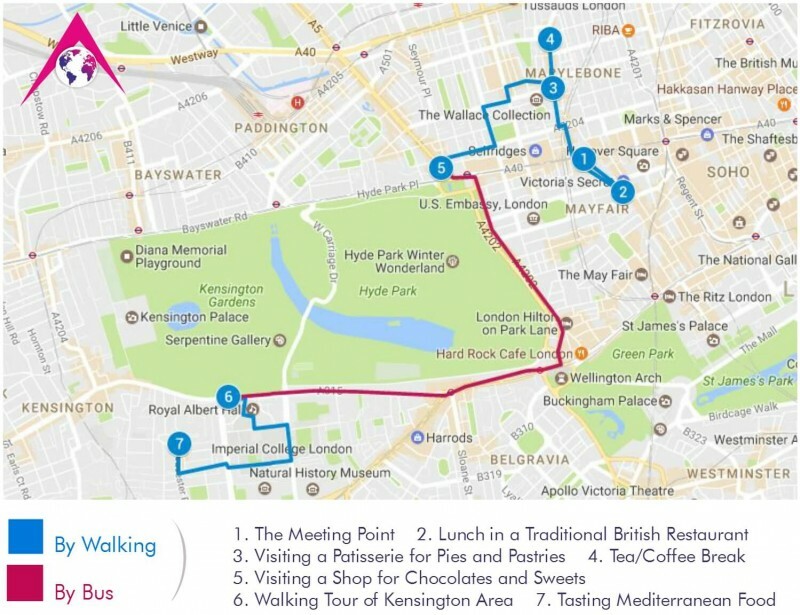 The walking tour ends in a colourful, family run, Mediterranean restaurant, situated in the heart of Kensington. They serve a wonderful selection of delicious Mediterranean salads and entrees. 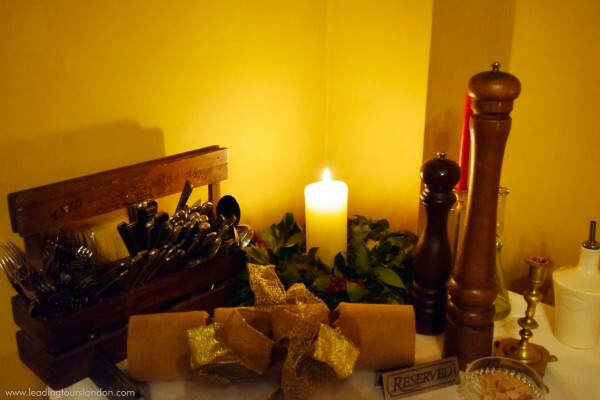 You will be delighted by the wonderful homey atmosphere and hospitality. 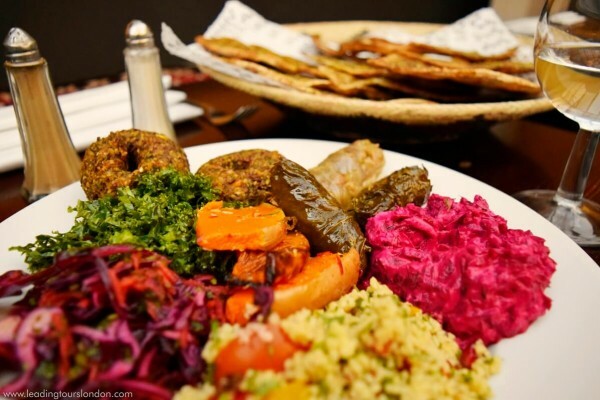 The food, that you are going to be served, is an exotic mixture of Mediterranean and Armenian cuisine. Try delicious stuffed vine leaves, healthy beetroot salad, interesting specialties made from pumpkins, chickpeas and much more …… Relish! Upon completion, your tour guide will take you to the nearest tube station, Gloucester Road, where the tour ends. 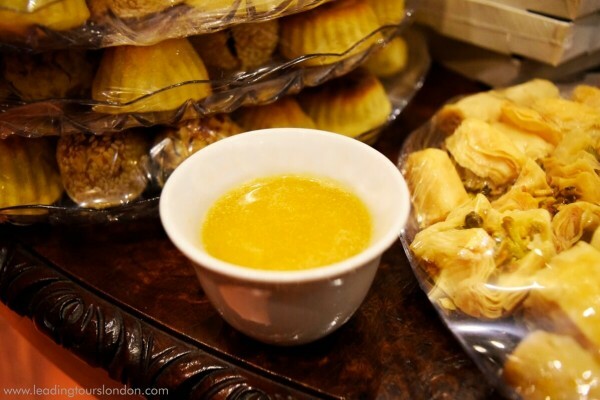 The Food Tour of London starts at 13:30h on Sundays. The duration of the tour is approximately 5 hours. It ends at Gloucester Road Tube Station at 18:30h. The Food Tour of London is non-refundable once booked. Please kindly notify us in advance, if you have some food allergies or intolerances. Once you make a payment, you will receive an email, verifying your successfull payment. The email will provide you with a unique reference number, which is the confirmation number. You must show this number to your tour guide upon request. You can either print it out or take a photo of your unique reference number.